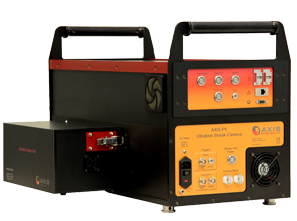 AXIS-PV: Ultrafast Visible-IR Streak Camera - Axis Photonique Inc.
1 ps (measured at FWHM). 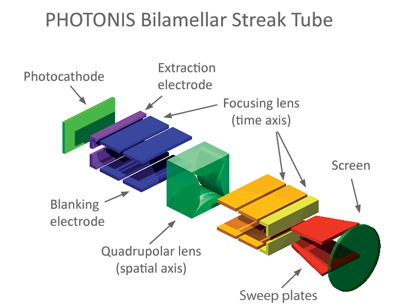 PHOTONIS bilamellar family: These UNIQUE tubes use bilamellar optics to provide a picosecond temporal resolution whilst maintaining excellent spatial resolution. 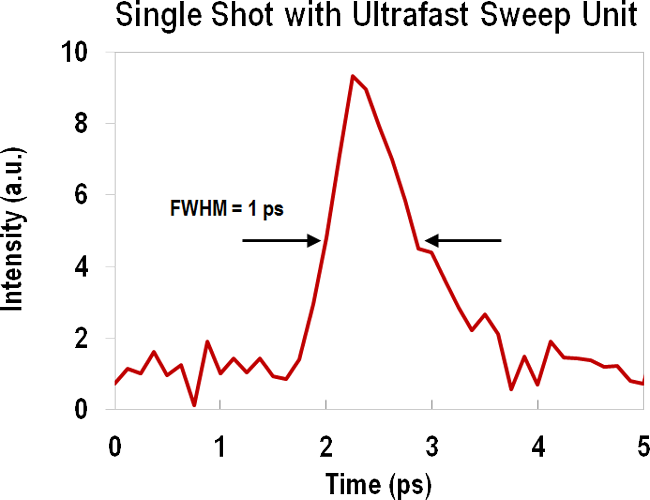 Time profile measured from a single 100 fs laser pulse at 800 nm. 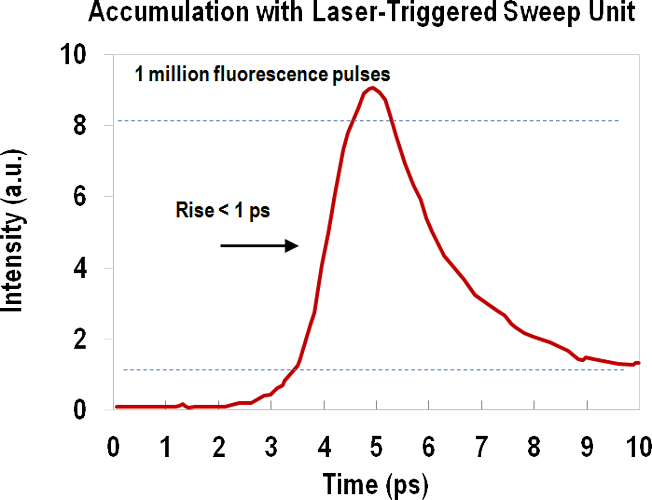 Time profile measured from a fluorescent sample illuminated by 100 fs laser pulses at 1 kHz repetition rate. This signal is the result of a 17-minutes accumulation (1 millions of shots). AXIS-PV is an autonomous system that is operated locally by connecting a monitor, a keyboard and a mouse. It comes with an internal computer that controls the streak tube supplies, the sweep circuits, monitors voltage stability, performs different self tests and safety checks. It can also control other optional peripherals via the USB port. High level device servers (TANGO, OPC, etc…) are available. to operate system via optical Ethernet 1 Gbs (1000 Base SX). Because of its 500 fs RMS jitter, this unit allows the analysis of ultrafast events at repetition rates up to 5 kHz while conserving the excellent spatial and temporal resolution of the AXIS streak camera. This is the ideal tools ultrafast spectroscopy with large dynamic range and high signal-to-noise ratio It requires about 100 µJ per laser pulse. 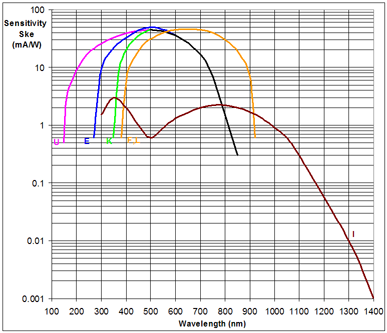 Only a fraction of the laser energy is taken to trigger photoconductive switches. This allows signal averaging over a large number of laser shots. This assembly allows sending a timing UV pulse on the photocathode. This pulses is sent through a UV optical fiber. This is to record an absolute time reference on each shot. 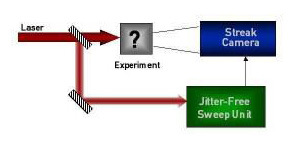 Operation mode in which the sweep crosses the whole screen in 0.5 to 15 second. It is used to characterize spatial non-uniformity in the instrumental response by illuminating it with a constant brightness light source. To power the whole system with a DC voltage between 23V and 28V. spectrometer that fits special needs.